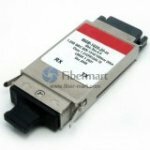 Besides SFP, SFP+, and XFP, Fiber-Mart also provides other transceivers such as GBIC, X2, XENPAK, SFF, and a special type of SFP called Digital Video SFP. These optical transceiver modules can be Customized, while we also provide Compatible versions as alternatives to those branded by Cisco, HP etc. All of our transceiver modules come with a lifetime advance replacement warranty and are 100% functionally tested.